Former members of the Berkut special force, accused by Kiev of instigating violence during Maidan protests a year ago, feel betrayed by the government and argue they had much less ammunition and supplies than those on the other side of the barricades. Mikhail, formerly a member of the Crimean Berkut, shows RT how he was equipped to confront Maidan protesters a year ago: A pair of leg guards, a helmet, a shield and a rubber baton. “We didn’t use weapons,” he says, recalling how protesters were growing more and more aggressive with each day and how he once went up in flames, after being hit by a Molotov cocktail. Mikhail says he didn’t like getting phone calls from home, as he had to lie he was in the rear so as not to scare anyone. But he was in the epicenter of the fighting. 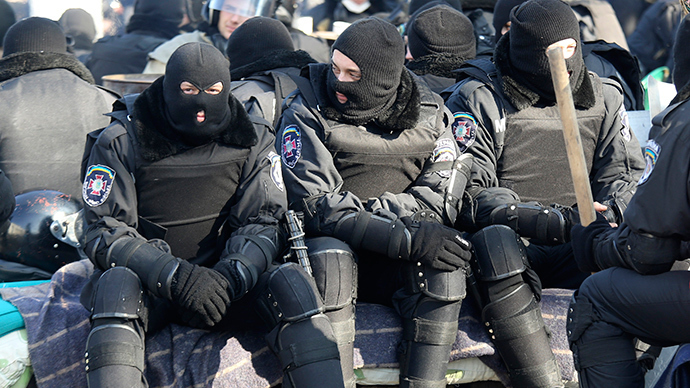 Being a member of the Crimean Berkut was double danger. Mikhail’s squadron did not take part in the bloody events of February 20, when more than a hundred people lost their lives. He says when they learnt of shooting in the streets they decided not to go there, as even their shields were not bullet-proof and they did not have guns to respond to gunfire. Accusing Berkut of violence is nonsense, Mikhail believes. After the February coup, he returned to Crimea, which in March voted for seceding from Ukraine and joining Russia. Mikhail says getting Russian citizenship was the most natural idea. Aleksandr Popov and Sergey Khairulsky, also former Berkut, feel the same about their Russian citizenship. They now serve in the Moscow paramilitary police and say they have nothing to be ashamed of. They feel betrayed by Ukraine. Sergey recalls Maidan protesters as a well-organized and well-sponsored force. Aleksandr and Sergey say it’s strange there’s almost not a word of casualties among the Berkut, while they saw police personnel die and get wounded. “On Profsoyuznaya one shooter injured six of our people,” Aleksands recalls. “Where he is shooting from is unclear. We went inside that house and found a young man and a girl each with a gun. We took them to the headquarters. I guess they later returned to Maidan as heroes”. Both the ex-Berkuts say they got machine guns on February 21, a day after the bloodshed. The weapons just helped them get out of Kiev, escaping the extremist Right Sector movement activists, who wanted Berkut publicly on their knees at Maidan and later on trial. All of the former Berkut interviewed say they don’t feel sorry for what they did a year ago, and wonder why fulfilling one’s duty could ever be interpreted as a crime. During last year’s clashes between Ukrainian anti-government protesters and riot police some 20 police officers and over 100 protesters – now revered as ‘the heavenly hundred’ in Ukraine – were killed. The majority were victims of the February 20, 2014, incident in which unidentified snipers started shooting on both sides of Independence Square and adjacent Instituskaya Street. The mass killings were the tipping point of the 2014 Maidan protest, escalating the already violent confrontation into an armed coup.